A couple of weeks ago, I had the opportunity to participate in the innovation session for travelers with disabilities. 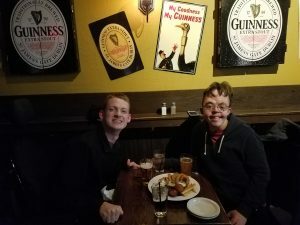 I traveled to Washington D.C. with the intention of increasing visibility to the needs of travelers with disabilities, but also to have a fun weekend. A little work followed by a little play! I took an airporter shuttle to SeaTac. This went smoothly. I was flying Southwest. There are no assigned seats which is a benefit for people with disabilities that pre-board because you can pick the seat that meets your needs best. When I arrived at BWI, the airport outside DC, I waited for everyone to get off the plane. Then I continued to wait for my wheelchair; I was told they had to take it to an elevator. When my wheelchair finally arrived, I noticed that the seat-belt was ripped. I told the gate agent who explained that in order to file a claim I had to go to the baggage claim office. I found the baggage office and then it took about 30 minutes to file a claim. A Super Shuttle was waiting for me at the other end of the airport; I thankfully caught that shuttle and after a long day of travel, I arrived at my hotel, the Marriott Bethesda Suites. When I checked in, the hotel staff were helpful and even got my bag off the back of my wheelchair for me. My hotel room was set up in a suite style; the bedroom was separate from the living area. Unfortunately, both the path of travel into the bedroom and the sink area were very narrow making the room not as accessible as it could have been. On top of the poor layout, the carpet was slippery (how is carpet slippery?). I will just say slippery floors and I do not get along. There were also no easily accessible outlets and I could not plug in my wheelchair the first night. I ended up having to get assistance to plug in my wheelchair charger the second night. This Marriott hotel is not near a Metro station; so, every time I wanted to go anywhere I needed an accessible cab which is hard to get in Bethesda, MD. On the second day of my trip, I attended a focus group of people with disabilities at Marriott’s Headquarters. The event was coordinated by the US Business Leadership Network (USBLN). If you would like to read the article written by the USBLN about this event, you can find it here. My friend Nate was flying in from Boston to hang out for the weekend. I decided to switch hotels and stay in my old stomping grounds (in Arlington, Virginia) for the remainder of my trip to be near a Metro station, where I would meet up with Nate. But first, I had a meeting to get to. The Marriott hotel staff helped me pack up my bag and I was ready for my 10:30 A.M. cab ride — that I had scheduled days in advance — to get to my 11:15 A.M. meeting in DC. At 10:30 A.M., no cab arrived; I continued to wait. The hotel staff finally got ahold of the cab company. At 11:00 A.M., I found out that the cab broke down and the company said that they did not have any other accessible cabs. It would have been nice for the company to contact the hotel when the cab broke down and give me this information. Thankfully, the hotel staff found another accessible cab through another company! This cab picked me up at 11:20 A.M., and I arrived at my meeting at 11:45 A.M. I had a great meeting with one of my mentors. Find his LinkedIn post about our meeting here. I also had lunch with an old coworker. After catching up with two old friends, I checked in to my second hotel; I stayed at the Holiday Inn Arlington. My room had a very nice accessible bathroom, but the room itself had a very narrow path of travel; there was no place to turn around. Even with the negative cab experience and the not-so-accessible, accessible hotel room, I had a weekend full of fun with my friend Nate. Ableism is real, and on this sixth day of travel — the day I was traveling home — ableism went rampant. It began at the airport. When going through TSA Precheck, I had to wait 20 minutes for a male assist with all of my luggage unattended (ironic, huh?). Then I received an evasive full-body pat down. The officer claimed new policy requires all wheelchair users — including travelers who have purchased Precheck — get pat downs. I had no problem with the actual flight and I had a nice small dinner at Alaska’s Boardroom (the airport lounge). It was finally the last leg of my trip, and I was almost home. However, what was a couple hours to go, turned into an unacceptable amount to go. 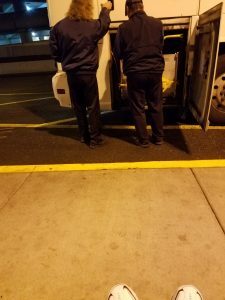 Long story short, my 7:00 P.M. shuttle to Bellingham came and went because no one could operate the wheelchair lift. At that time, they had no alternative solutions to get me home. Later, I was told that the shuttle coming at 10:00 P.M. would be accessible. When the bus did not show at 10:00 P.M., I was told that it would arrive at 11:00 P.M. After traveling across the country, then waiting four more hours than anticipated for an accessible shuttle, I MADE IT HOME!